Every winter I take five days off and head down to south for some rest and rejuvenation. As I countdown to the departure I hope for lots of rain and storms for the trip. You may think me strange that I love the wet, stormy weather but there’s nothing I find more relaxing than sitting by a fire with a storm swirling outside and this year I wasn’t disappointed. My partner and I returned to our shack where we have stayed for the last few years, which is a lovely cottage at Forest Rise Eco Retreat in Yelverton, perfectly placed between Busselton and Margaret River. The one-bedroom cottages are mud brick, fully self-contained with a log fire, television, entertainment system and a superb bathroom with spa bath under a glass roof. On arrival a peaceful bird song is playing, the heater is on and the fridge is stocked with cheese, chocolates, wine, beer and bread. It’s completely surrounded by forest and it feels like we could be the only ones in the world apart from a visiting kangaroo or two. Forest Rise think of all the little things and outdoors there’s a gas barbecue with table setting, stock pile of wood, two bicycles and secluded outdoor shower, which I even braved one day. Inside there’s a fully functioning kitchen with tea, coffee machine, sugar, salt and pepper, dvds, games and music and all linen is supplied. On the way we stock up at Bunbury Farmers Market and really just bunker down for most of the stay reading, relaxing and cooking, although we schedule one day to get out and about. The day we chose to head out was a rainy, cold day, just as we like it, and we drove down to Prevelly Park to check out the wild seas before deciding on a few wineries to visit. 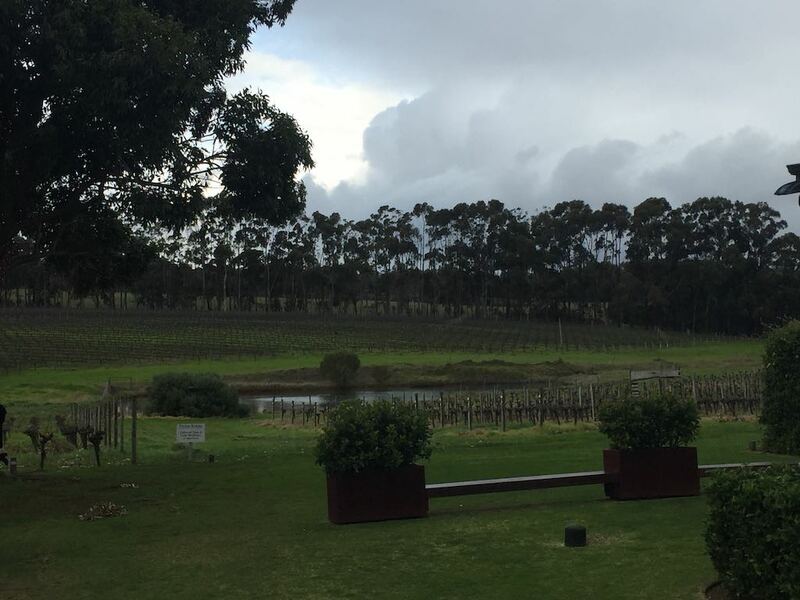 Our first stop was at the family owned boutique winery Gralyn Estate located at 4145 Caves Road in Willyabrup. 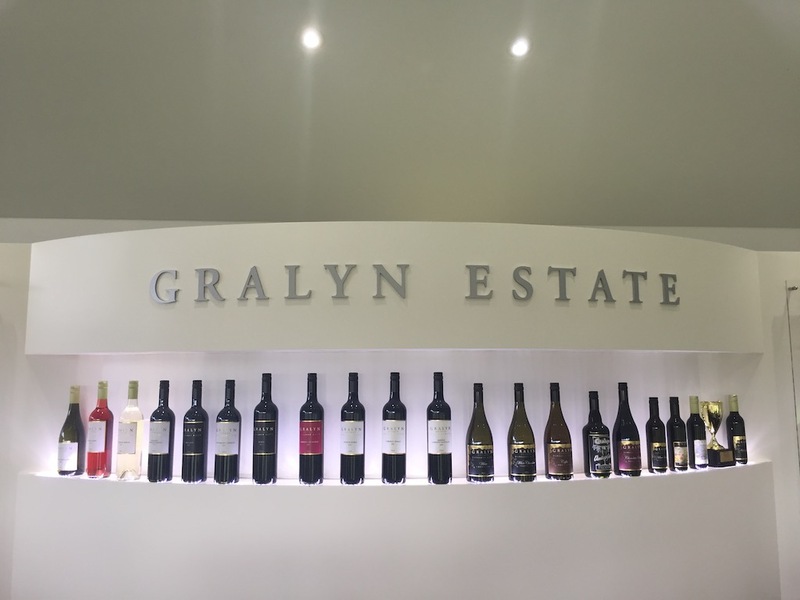 Gralyn planted their first vines in 1975 and specialise in some superb fortified wines. We’re not big on whites so we tasted our way through their red selection and chose the slightly sweetish Racy Red 2017 and Late Harvest Cabernet which we thought would complement desserts beautifully. Their selection of fortified wines are delicious and we couldn’t leave without a bottle or two of their White Chocolate 2017, Chocolate Ruby 2017 and one of their Classic Muscat. They make the perfect accompaniment for a cheese plate and even better when served and eaten around a log fire. 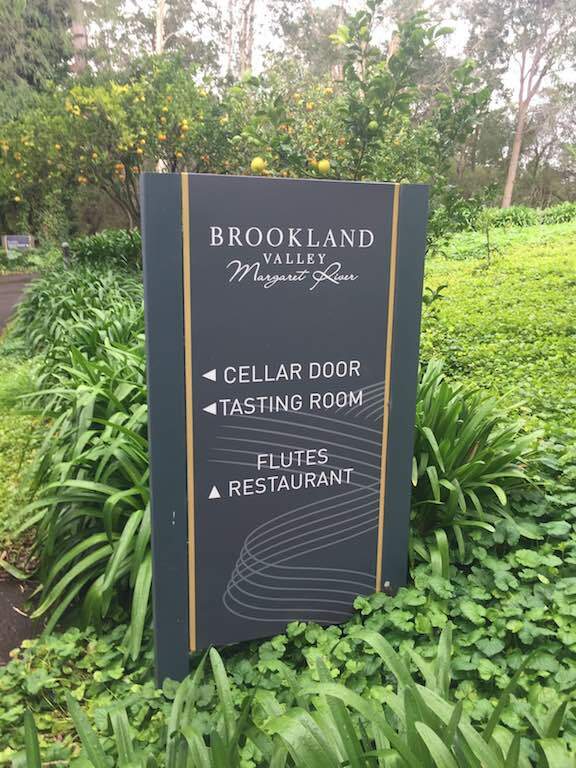 Our next stop was Brooklyn Valley on Caves Road where we tried a couple of their Classic reds including the old backstop Verse 1 Cabernet Merlot. They offer a couple of cellar door only wines, made in small batches which included a rosé, Pinot Grigio and Rojo Grande but we personally preferred the Cabernet Merlot. The grounds at the winery are lovely and well worth a wander around. On site is Flutes restaurant which offers a three-course meal deal for $60 from Thursday to Monday. As we drove along Metricup Road, I was intrigued by a sign outside the pretty pink chateau style building of Fermoy Estate which stated they had been awarded the world’s greatest cabernet in 2015 so we stopped to investigate. I was pretty impressed to see that Fermoy’s Reserve Cabernet Sauvignon 2013 took out the world’s best cabernet trophy in 2015 at the Concours International Des Cabernets, Paris, France. 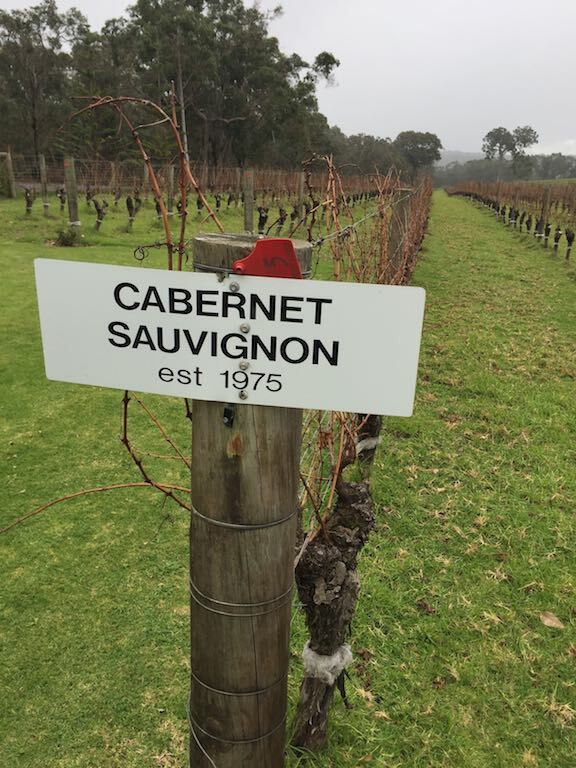 Fermoy can also boast supplying royalty when Australian chef Luke Mangan chose their 2001 Cabernet Sauvignon from a blind tasting to serve with lamb at the wedding of Prince Frederick of Denmark to Australia’s Mary Donaldson. The staff at Fermoy are warm and welcoming and not only do you get to taste some world class wines, there’s a good selection of artwork in the tasting room including a couple of Bromley’s pieces. Also located on the property is the Pukara Estate olive oil company and though not WA made, the Australian supplier offer some quality oils and vinegars to sample and buy. We couldn’t leave without a bottle of the smoked olive oil and a jar of their wasabi mayonnaise. We had left our cottage about 10am and by the time we meandered around it was almost 2pm and we were ready for lunch. We seem to be creatures of habit on this trip as we were hankering to return to Rustico at Hay Shed Hill winery. 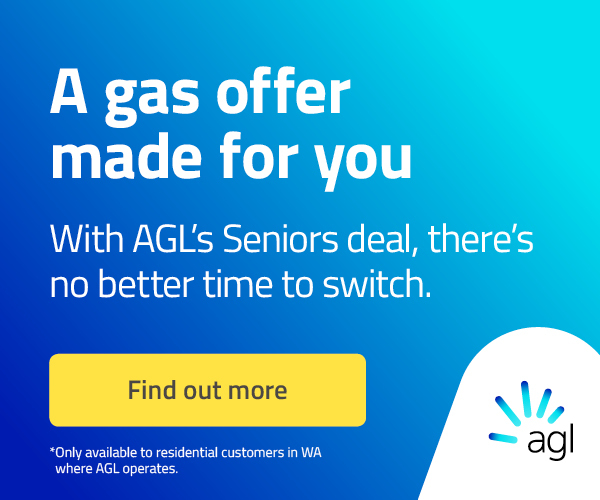 They offer tapas style tasting plates, paellas, pizzas and a six-course degustation menu and we just find the service and quality of the food excellent. Obviously so did half the other tourists in the area and we thought we’d safely get a table when we turned up around 2.30pm. A word of advice is to book if you plan to eat at Rustico, fortunately their kitchen is open until 5pm and we did eventually get a table after about a half an hour wait. The wait gave us the opportunity to sample Hay Shed Hill’s range of wines. They produce a particularly good sparkling wine and they also had some lovely clear skin cases of their pitchfork range for $10 a bottle in a case buy. They also stock a lot of other products and have some lovely items for sale, perfect for gifts. By the time our table was ready at Rustico we were famished so we couldn’t resist their six-course degustation lunch which included Hervey Bay Scallops, Tempura Spanish Mackerel, Beef Carpaccio, Pork Belly, 57°C beef and finished with a dessert tasting plate. The degustation can be paired with wines, but after an afternoon of tastings we decided to enjoy a glass of sparkling with the meal. We felt like the judges from Masterchef, oohing and ahhing over each course and picking out the unusual flavour combinations. The degustation costs $65 each without wines and is worth every cent, plus after the late lunch dinner is not required. Personally I think Rustico offers some of the best food in the region and I am happy to return to eat there every year. For those who don’t want to travel so far, another Rustico is located in Rockingham. Looking out to vineyards, the rain came in and it reminded us that we live in a very special part of the world and the winter season should be embraced. Accommodation – Forest Rise Eco Resort www.forestrise.com.au 9755 7110. Lunch – Rustico at Hay Shed Hill Winery, Open 11am to 5pm daily. Book on 9755 6455.